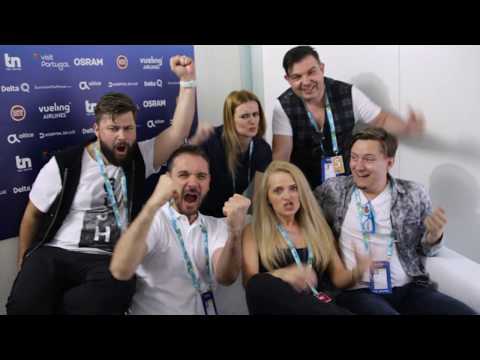 The enthusiasm in the Eurovision Song Contest in Romania increases from year to year. The good results are definitely a big contribution to this effect. Out of 19 participations, Romania reached the Grand Finals 18 times (13 since 2004), this is a statistical chance of 93%. Compared to the neighbour countries the Romanian entries have been very contemporary and radiofriendly. In this year’s national final Selecția Națională, the highly favourized singer Feli has been beaten by The Humans with “Goodbye”. The group consists of six members: Cristina Caramarcu (vocals), Alexandru Cismaru (guitar), Alexandru Matei (keyboard), Alin Neagoe (bass) and Adi Tetrade (drums). The Humans has been formed a year ago out of the previous band Jukebox. The style of their music is funk, pop and rock. The lead singer Cristina Caramarcu firstly wanted to become a policewoman, studied psychology, took singing lessons and became a singer. She also took part in The Voice Romania. The song “Goodbye” is a manifest for everybody to fulfil their dreams, despite of heritage or social status. The modern composition is a bit in the 1980’s style of T’Pau ("China in your hand"), but not as melodic. Due to the strong competition it will be tough to get through the semi final. Let’s hope that it won’t mean “Goodbye” to Romania in the Grand Final. This year it will be the 19th time for Romania in the Eurovision Song Contest. The debut entry “Dincolo di Nori” by Dan Bittman in 1994 only made the 21st place. One year before there has been an international pre selection held in Ljubljana, Slovenia, where Romania could not qualify to the 1993 ESC in Millstreet with the entry “Nu pleca” by Dida Drăgan. Romania’s entries distinguished modern and up to date songs, less folkloristic elements like the neighbour country Moldova. With a little help from the neighbour countries in particular Moldova, it was always possible for Romanian entries to qualify for the Grand Finals – the chances are at 93%. But Romania only made it five times into the Top10. So there is a statistical chance of 29% to achieve a Top10 place for Romania. In the year 2016 the Romanian entry has been disqualified due to financial issues of the Romanian broadcaster TVR at the very last minute. The Romanian candidate Ovidiu Anton could not sing his entry “Moment Of Silence” in Stockholm. Last year Ilinca ft. Alex Florea could achieve a fantastic 7th place with “Yodel It!” in Kiev.